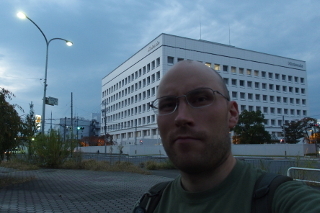 Outside Nintendo HQ in Kyoto, Japan, or as we like to call it, "the 3000 euro selfie". A bit of a pilgrimage, that really turned out to be rather anticlimactic. I like to travel. The last couple of years I've mostly been to eastern Europe. If I could afford it, I would probably do the Dorky White Guy thing and spend a couple of months in Asia. I tend to wander off on my own and will often miss/avoid the normal sightseeing spots. I ride trams to run-down industrial areas and take photos of weird things. I also switch to a strange metabolism when I'm on the road, so I tend to eat ridiculous amounts of yoghurt. Going on trips with friends or partners can be fun, but I have also come to appreciate travelling on my own. It is very liberating and not at all as scary as some people seem to believe. Full list of countries I have visited: Sweden (obviously), Norway, Finland, Denmark, Poland, Germany, Estonia, Belgium, United Kingdom, Japan, Spain, Tunisia, Hungary. I have also visited all of the 25 historical provinces (landskap) in Sweden, and lived in 3 of them. You can also have a look at my photos of parking ticket machines! travel.php was last modified on 2018-12-29 and should be valid XHTML 1.0 Strict.